Aqua Spa Relax Body Creme: I really loved this rich cream. Despite its thick texture it absorbed quickly, left no greasy residue, and kept my skin soft all day. Its lavender and chamomile aroma was quite perfumey when first applied, but it quickly diffused into a much more subtle scent that I really liked. Benefit Total Moisture Facial Cream: This tiny jar – from my Benefit Advent Calendar – saved my face during the last dry days of spring. When my tinted moisturizer just couldn’t provide enough moisture, I paired it with this thick-but-not-too-thick cream. It kept both dry patches and blemishes away while providing a perfect base for makeup. L’Oreal Volume Filler Thickening Shampoo: I found this shampoo incredibly disappointing. Since the ads for it featured Blake Lively, the queen of enviable hair, I was really hoping this shampoo would leave me with luscious locks. Instead it left my hair looking dry and dull, with no shine and a straw-like texture. Bliss Grapefruit & Aloe Body Butter: With its fresh citrus scent and rich texture, this body butter became my go-to hand cream throughout the winter and spring. It absorbs quickly and protects hands and cuticles for hours, even through the excessive hand washing of flu season. Aussie Moist 3 Minute Miracle: This deep conditioner isn’t new to this blog, and neither is my opinion of it. This is a high quality conditioner that can be used daily or as a weekly treatment. It repairs hair and leaves it silky and shiny without weighing it down. I still swear by it. Bliss Multi-‘face’-eted All-in-one Anti-aging Clay Mask: I decided to try this multi-tasking mask last weekend and almost instantly regretted it. It contains 10% glycolic acid, which was so harsh I had to wash it off after four minutes and still ended up with a chemical burn near my lip! Then my skin promptly broke out with several small pimples. Definitely not a fan. Whish Shave Cream: I recently wrote about this Birchbox find. I liked it more with every use. It really moisturized my skin and softened hair, leading to a closer-than-usual shave, less irritated skin and smooth legs that stayed that way for almost a week. Bath & Body Works Dark Kiss Body Lotion: This medium weight lotion featured a sort of sweet, sort of sultry scent and kept my dry patches in check through the spring. It didn’t clog pores and it gave my skin super soft all day. A perfect lotion for spring and/or fall. Beauty Protector Beauty Wash: This shower gel featured a sickeningly sweet scent and though it lathered up richly, it didn’t leave my skin feeling particularly clean. I’m a big fan of Beauty Protector’s hair products, but this body wash is definitely not for me. 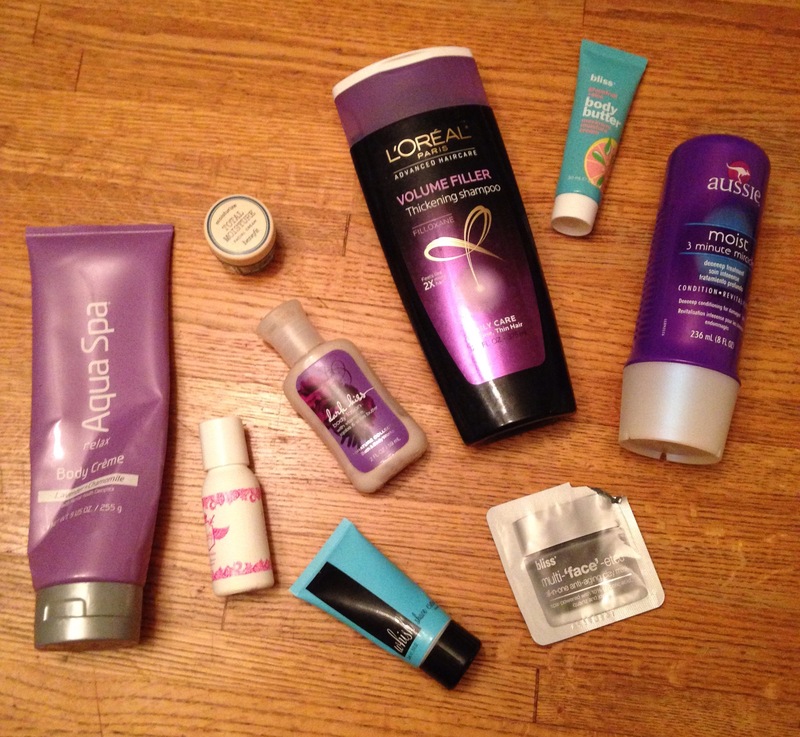 In other news, I finally came to the end of my body lotion stash last month! For those keeping track at home, it took me one year and five months to clean out that collection. So, now that I’m in the market for new lotions, please feel free to leave some recommendations in the comments below! This entry was posted in Beauty, Body care, Empties, Hair care, Hair removal, Skin care and tagged Aqua Spa Relax Body Creme, Aussie 3 Minute Miracle, Bath & Body Works Body Lotion, Beauty Protector Beauty Wash, Benefit Total Moisture Facial Cream, Bliss grapefruit & aloe body butter, Bliss multi-face-eted mask, Empties, L'Oreal Volume Filler Thickening Shampoo, Whish Shave Cream. Bookmark the permalink. I received the Whish Shave Cream in a Birchbox a while back and at first I wasn’t sure about it since it didn’t foam up, but it ended up being very moisturizing and smelled amazing! Lost this post! What scent did you get? I wasn’t sure about the lack of foam either, but it’s a really great shave cream! I had the blueberry one! I would love to try the almond or coconut scent one! !